Nobody has currently been here. 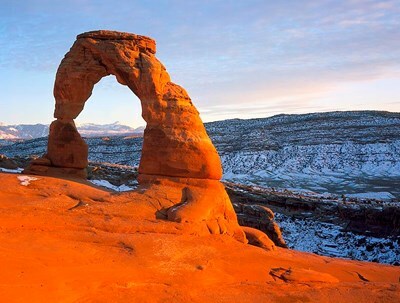 Utah is a western state of the United States. It was the 45th state admitted to the Union, on January 4, 1896. Approximately 80% of Utah's 2,784,572 people live along the Wasatch Front, centering on Salt Lake City. This leaves vast expanses of the state nearly uninhabited, making the population the sixth most urbanized in the U.S. 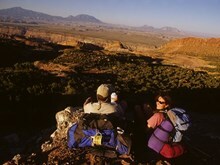 The name "Utah" is derived from the name of the Ute tribe and means "people of the mountains" in the Ute language. Vermilion Cliffs National Monument is located in Arizona, immediately south of the Utah state line. This National Monument, 294,000 acres (1,190 km) in area, protects the Paria Plateau, Vermilion Cliffs, Coyote Buttes, and Paria Canyon. Elevations in the Monument range from 3,100 feet to 6,500 feet above sea level (944 to 1,981 meters). 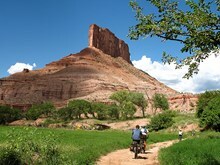 Connect the dots (six spare but well-outfitted huts spaced approximately 35 miles/56 kilometers apart) on a weeklong mountain bike expedition that starts in the jagged San Juan Mountains and ends in Moab. Harder and more isolated than its twin, the venerable Telluride-Moab ride, the 215-mile (346-kilometer) Durango-Moab route presents navigational and bike-handling challenges and a sense of unfettered freedom." The Hayduke Trail was founded by hikers Joe Mitchell and Mike Coronella, who wanted to go out on a long, Abbey-esque trek that celebrated the land. They set a route that spans the Colorado’s Plateau’s must-see list of postcard landscapes, starting in Arches National Park (where Abbey worked), heading through Canyonlands National Park, down into Capitol Reef National Park, across the Grand Staircase-Escalante National Monument, into Bryce Canyon National Park and the Grand Canyon, and finally ending up in Zion National Park." Few climbs anywhere match the heady sensation of topping out on Castleton Tower in Castle Valley. 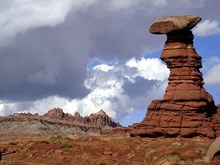 You stand alone on a sheer parapet of red Wingate sandstone, 450 feet (137 meters) tall, but as it crowns on a talus slope, you’re nearly a thousand feet (305 meters) above the desert floor and the Colorado River, your 360-degree view dominated by the LaSalle Mountains on the southwestern horizon." The surreal stripes and rolling rock hills of the Vermillion Cliffs look like something hand-sculpted by a pottery maker rather than a naturally formed landscape only touched by Mother Nature. A sandstone wonder that spans 280,000 acres in the middle of Kaibab National Forest and Glen Canyon, these swirly parts are inhabited by kondors, slithery rattlesnakes, and an occasional scorpion. 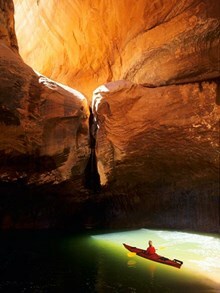 The huge upside of Glen Canyon Dam on the Colorado River, nexus of an environmental battle lost a generation ago, is the emergence of its progeny, Lake Powell, as a supreme freshwater kayaking destination. The lake’s green-water tentacles extend from the main 185-mile (300-kilometer) watercourse into 96 side canyons, where kayakers can paddle free of tides, waves, currents, and motorboats." One of the most dramatic shot runs in the U.S. Four days of Class III through Dinosaur National Monument’s Gates of Lodore." The Wave in Utah - Carved rock eroded into a wave-like formation made of jurrasic-age Navajo sandstone that is approximately 190 million years old." The deep, tangled canyons of southern Utah are a remote and unforgiving country with the ever present danger of flash floods, extreme temperatures, lightning storms, and waist-high quicksand. In other words, perfect habitat for canyoneers, who know that the area’s unbroken wildness and otherworldly wind- and water-sculpted chasms are precisely what make it so appealing. 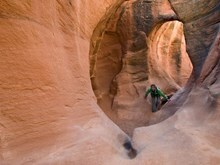 Many canyons still remain unnamed, making true exploration a possibility."